Back finally to an old topic leftover from the climate inquisition a few weeks back. One of our lefty commenters thought it important to raise the issue that I don’t publish “peer-reviewed” articles about climate issues in the academic literature, which is true. It’s something I have in common with Al Gore. (Heh.) Besides, I prefer to write in plain English for human beings rather than the 10 people who read most academic journals. More to the point, I am currently a regular peer reviewer for one of the leading academic journals in the energy and climate policy domain, though I shouldn’t say which one since peer reviews are supposed to be anonymous. And finally, about ten years back I was an invited peer reviewer for the EPA (!!) on one of their larger data analysis projects, though it had nothing to do with climate change. So it turns out that I have infinitely more peer review experience than Al Gore (“infinitely” since his peer review record is precisely Zero). It is probably generous to paraphrase Churchill’s phrase about democracy to suggest that peer review is the worst form of academic quality control except for all the others that have ever been tried. First of all, how does “peer review” actually work in practice? Journal editors send out queries to academics asking if they’d agree to referee a submitted article. Even journals with lots of editors may not be intimately familiar with everyone working in a specialized subfield of science, so how do they know whom to query? Often the authors of the submitted articles suggest people—their friends and allies—as peer reviewers. (That’s how I got my first peer review assignment from a journal, and now the editors seem to like my reviews sufficiently that they are asking me to referee papers from people I’ve never heard of; right now it is two Chinese authors.) Even though their peer reviews will come in anonymously, helping to select at least some of your peer reviewers will increase the chances of a partially favorable review panel. And even if the articles are sent to you with the author or authors’ names stripped out, you can usually guess who the authors are easily enough from a careful reading of the bibliography. These problems don’t even get to the deeper problem of the extent to which peer review is an insider’s racket. One of the more damaging revelations of the “Climategate” email scandal in 2008 was the admission of Phil Jones, head of the Climate Research Unit at East Anglia University, that he would seek to keep contrarian or skeptic climate literature out of the IPCC process “even if we have to redefine what the peer-review literature is!” Nothing says confidence in science like manipulating the article inclusion process. 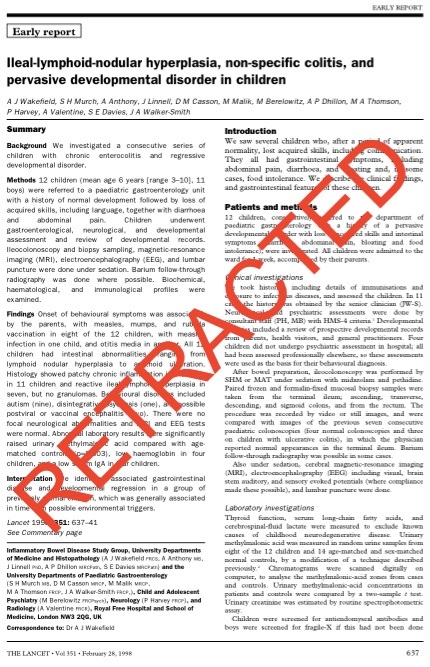 A major publisher of scholarly medical and science articles has retracted 43 papers because of “fabricated” peer reviews amid signs of a broader fake peer review racket affecting many more publications. Meanwhile, the Committee on Publication Ethics, a multidisciplinary group that includes more than 9,000 journal editors, issued a statement suggesting a much broader potential problem. The committee, it said, “has become aware of systematic, inappropriate attempts to manipulate the peer review processes of several journals across different publishers.” Those journals are now reviewing manuscripts to determine how many may need to be retracted, it said. This is not an isolated incident. There’s a whole website, RetractionWatch.com, that follows the increasing number of retractions of bad articles. Just how did this article pass peer review? I think the editors of The Lancet, one of the world’s premier medical journals, ought to explain that in detail. But notice something else about the Wakefield article pictured nearby: The article lists 12 co-authors along with Wakefield. This seems to be the typical mode with scientific articles: casts of thousands sign on as “co-authors” of an article even if they did little work on the actual research. You almost never see a long cast of authors in social science articles (three or four seem to be the outer limit), even when a professor may use a large team of graduate students to conduct field research. In purely scientific publishing it seems to be a way of casting science as a majoritarian enterprise—a means of granting false authority and certainty. (And it’s an easy way of listing another publication on your CV.) I’ve come to adopt a rule of inverse judgment: the more authors listed on a science article, the more skeptical I am. How many co-authors did Einstein have for his breakthrough paper on general relativity? Meanwhile, as Washington Post reporter Jim Tankersley pointed out last week, the most devastating critique of the Thomas Piketty hypothesis about income inequality, currently setting the entire controversy on its head within the highest reaches of academic economists, has come from an MIT graduate student who published his 459-word critique . . . on a blog. Heh.